Fire can come unexpectedly for any number of reasons—anything from bad wiring to deliberate arson. However, with cutting-edge fire systems, your business won’t suffer extensive damage and repair costs. Learn more about what Alarm Solutions, Inc. provides for your business in fire safety. Alarm Solutions, Inc. can easily link up your existing building’s sprinkler systems to a cutting-edge fire alarm system. This ensures that once a fire starts and water comes through the pipes, you are instantly alerted. Not all fire alarms are equal in modernity or features. However, the experienced fire alarm technicians at Alarm Solutions, Inc. have experience with over 30 different fire systems, including older systems that not all fire alarm technicians would know how to service. 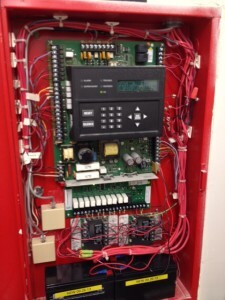 We can work on any fire alarm panel or fire alarm system, not just a few that we are familiar with. A fire can immensely impact your business. Important documents can be lost and repair costs can be substantial. Occasionally, a fire forces you to rebuild or move to a new location. Don’t let this happen to you. With a fire alarm system from Alarm Solutions, Inc., you are aware of when a fire is threatening your business. Call today in Lane County at 541-746-0527.